It was the hope of most people that because of the discussion tat took place between United National Front and President this night, would bring in some settlement to the crisis at hand. However, what former minister Lakshman Kiriella informed was that discussions which ended this night around 9.45 became a total flop. and when President inquired as to who it was, those who attended the discussion have said, "who else it is other than Ranil?" The President on that occasion has said that even if the 225 placed their signatures in parliament, he would never again appoint Ranil Wickremasingha. Though United National Front has informed that they have no other alternative than Ranil, the President has not released his reins. 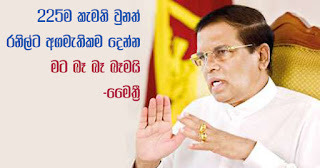 President Maithripala Sirisena has discussed this topic with MPs of United National Front last Friday; but there was no vacancy for position of Prime Minister at that time. However, when an enjoining order was issued by court judgement for Mahinda's position, there had been no positive response from the President as such. Therefore, under these circumstances the gathering dispersed without any decision being taken regarding the Premiership in the country.